GRI 401-1 New employee hires and employee turnover 685 New Employees hired. GRI 401-3 Parental leave No case of employee rejoining after maternal leave. Details of KNPL employees are included in business responsibility report: principle 3.Details on employee hiring and employee turnover during last financial year are mentioned in tables below. Total 685 employees were hired. We, at Nerolac, are committed to create a learning environment which is business – centric whereby the employees are developed as leaders and are prepared to meet current & future business objectives through deployment of a “pull” strategy rather than a “push” strategy. 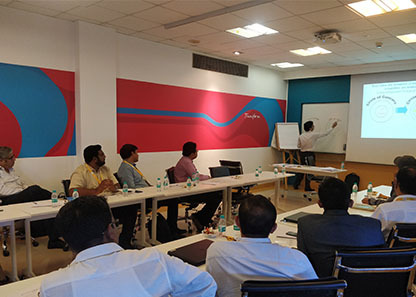 Employees are encouraged to broaden their horizon through training programmes as well as other employee engagement forums such as Kaizen competitions, Performance review process, monthly review of section performance etc. Induction Training - Induction training is given as an initial preparation to new hires upon taking up a post. Competency based Training - Competency Based Training emphasizes on enhancing the competencies required by a person for a particular job and position, in order to achieve individual growth and organizational goals. Functions specific Training - Functional Training aims at upgrading the employees’ functional knowledge to keep up with the ongoing internal and external changes, which affects the day to day working in the short run and the individual & organizational growth in the long run. Skill Development program - Skill Development programs aims at upgrading and multi skilling the employees’ current skill level by means of Work Instructions, Standard Operating Procedures and Single Point Lessons. Advanced Sales Program - aims at training and upgrading the Frontline Sales personnel to develop the face-to-face selling skills which are needed to promote an open exchange of information thereby reaching to mutually beneficial sales agreements. Jump Sales Training (JST) - internal program is designed for the senior frontline Sales personnel in the organization. The program aims to equip the attendees with better planning and execution skills and prepare them for delivering on set expectations. The program is broken into 5 modules covering Sales Management as a subject with relevant theory and illustrations. The program also covers a session on ‘Influencing Skills’. During last financial year, training in terms of man-hours per employee has been calculated as 5.9. KNPL is an equal opportunity employer. All recruitment for senior positions is based on talent and suitability of candidate with respect to a job vacancy. But local candidates are preferred in case their portfolio matches with job requirement. During last financial year, there have been no incidents of discrimination. KNPL employees receive feedback on their performance at regular intervals through ‘HRSCAPES’ an in-house KNPL portal. 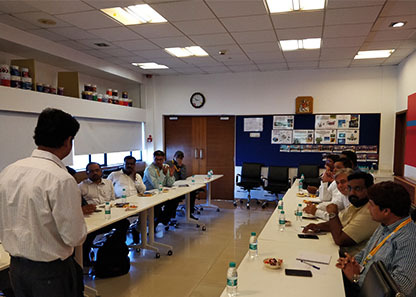 KNPL has created various platforms to connect with the employees through programs like Coffee with HR, Departmental connects, Idea Management. HRSCAPES also facilitates communication with respect to Key Result Areas, attendance, and performance feedback. All policies are communicated through HRSCAPES portal. Whistle blower policy and code of conduct of the company have been shared on HRSCAPES. As a policy, the Company keeps wages of its employees above the standard entry-level minimum wages fixed by the State Government. There is no gender differentiation in the Company’s wages. 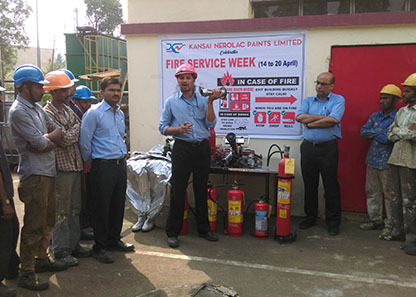 Last year, company continued its efforts on strengthening “Safety First” culture with utmost focus on EHS training, fire prevention programs & emergency preparedness. As a part of Safety excellence, we pursued sustenance of safety process controls such as interlocks and past Corrective and Preventive Action (CAPA) compliance. 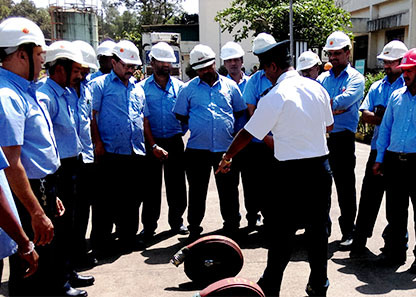 Through its specialized Danger Experience training program and Kiken Yochi Training (KYT – Hazard Prediction) program, company has been embarked upon journey to instill maximum safety awareness and subsequently promote safe behavior across plants. Corporate safety team evaluated safety awareness at plant through online safety test and analyzed results further to drive improvement measures. Safety culture survey was conducted through HR portal for process employees and feedback was recorded. It led us to improvement opportunities to work upon in the areas of employee consultation and training at some of the plants. Last year, company also invested upon Safety training Kiosk system with customized Safety training modules on machine safety and static charge prevention. It will help us to train all employees in time efficient manner. It would add to our safety leading indicators in order to influence safe behavior at workplace. The company encourages worker participation in health and safety topics. Each of our manufacturing sites has established Safety committee with at least 50% of representatives from operators and is in compliance with Factories act, 1948. Safety committee meeting at plant level acts as platform to take feedback and consultation from workforce representatives. Plant works manager acts as chairman in this meeting to preside over and guide discussion. In coming year, company has planned for various safety theme competitions in order to popularize safe work practices and behavior. It will further help to strengthen “Safety First” culture through employee participation at all level. To enhance safety vigilance, company will be implementing tool for reporting of safety concerns and its tracking to ensure timely closure. Company ensures compliance with statutory provisions related to child labour. There is no risk of forced or compulsory labour with respect to any of our manufacturing facility. All new joinees are made aware on KNPL code of conduct as well as whistle blower policy. All KNPL policies regarding code of conduct and ethics have been well communicated through HRSCAPES portal. Company did not receive any complaints related to child labour, forced labor or sexual harassment during last year. Also, company did not receive any complaint from local community with respect to violation of human rights. KNPL is an equal opportunity employer and there have not been any incident of descrimination in company. Company encourages freedom of association and collective bargaining. All of KNPL plants have labour unions to facilitate collective bargaining process.Collective bargaining agreement at all of our manufacturing sites cover 100% of company workers. It covers health and safety related topics such as adherence with safety norms, upkeep of emergency equipments etc. To resolve issues that may significantly impact service conditions of employees, formal mechanisms have been put in place to communicate and address employee concerns at regular intervals. Monthly communication and works manager dialogue at manufacturing sites help to communicate organisation progress, its expectation to employees including workers. Monthly meeting with union management also help address issues pertaining to management as well as employment. All issues with respect to labour are addressed through collective bargaining and are resolved.There is no significant risk with respect to violation of right to exercise freedom of association and collective bargaining at manufacturing sites.There have not been any human rights grievances reported in the last financial year.